Looking for work invoice templates? Whether you work in residential or commercial business, we've got you covered. Plus, it's free! Do I need more than just a work invoice template? You already put in a lot of hard work, so let us handle the hassle of billing. 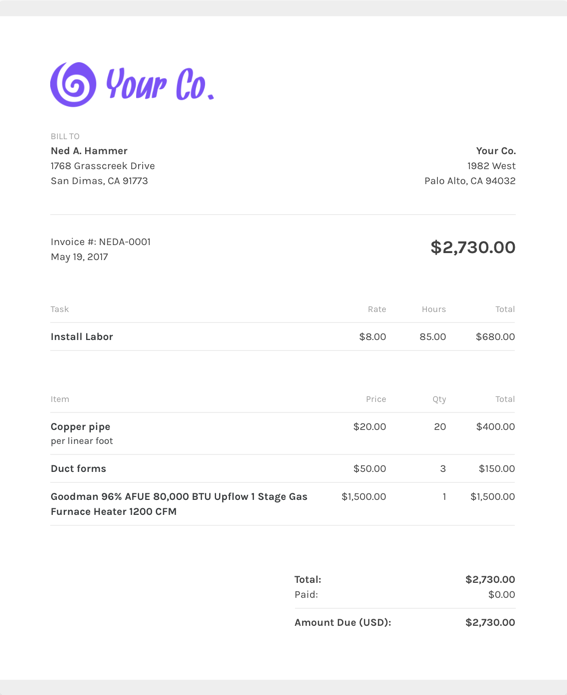 The ZipBooks work invoice template has a clean, fresh design that you can easily make your own. Once you set up an invoice, we have the option to set up auto-billing for your regular customers. Our template isn't just a regular work invoice template. Check out what else we offer below. What should I include on my work invoice template? An awesome thing about ZipBooks is that you can rely on industry expert advice about what to include and when to send your invoices based on prompts that we provide as part of a free invoicing software service. Using ZipBooks for your work invoice means never forgetting to include critical information. We’ve collected data from tens of thousands of invoices and use it to score your invoice based on what information you include so you’ll get you paid faster. Why should I use ZipBooks’ work invoice template to create and send my work invoice?